Frankenstein is not the monster that most people think he is. He is just the misunderstood creation of a mad scientist. 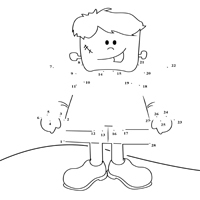 Let us help this poor beast by printing and completing his dot to dot picture puzzle. We love you Frankenstein!